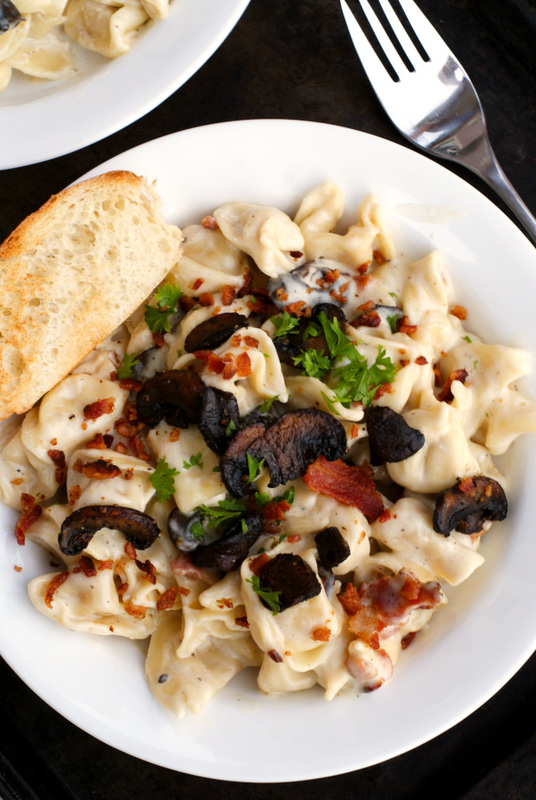 Parmesan Tortellini with Mushrooms and Bacon is a creamy and cheesy pasta dish featuring cheese tortellini swimming in a rich parmesan sauce tossed with caramelized mushrooms and smoky bacon. This recipe goes along with the mindset that if you're going to do something, well, you might as well go all out. There's no holding back when it comes to the richness in the delicious pasta dish. Cooking with tortellini is one of my favorite ways to mix it up when it comes to pasta night. Cheese filled is my favorite, but this dish could easily work with whatever tortellini filling you like. Tortellini is especially yummy when you serve it with a decadent sauce like this one! There's a boat load of parmesan cheese (hence the name Pamesan Tortellini) in this creamy sauce. Oh, and heavy cream, too. All I'm saying is that you might have to break out your fat pants when you make it. And we haven't even mentioned that fact that there's bacon! Madness. Sheer, glorious, indulgent, cheesy, bacony madness. And I'm betting you'll love every bite! Cook the tortellini according to the package directions. Meanwhile, in a large skillet over medium-high heat, cook the bacon until crisp. Remove to a paper towel-lined plate and crumble into small pieces. Add the mushrooms to the bacon grease and cook, stirring often, for 8 minutes or until golden. Reduce heat to low and add the cream cheese, heavy cream, and butter to the mushrooms; season with garlic powder. Continue cooking, stirring often, until the cream cheese is melted. Stir in the parmesan cheese and cook for an additional 5 minutes, or until all of the parmesan cheese has melted. Toss the cooked tortellini with the sauce and crumbled bacon. Season with salt, pepper, and fresh parsley to taste.